University of Kentucky Aquatics took home the team title on the final night of competition. Kentucky also won the men’s team title, while St Charles Swim Team took home the women’s team title. Last night’s 200 backstroke champion Sophia Sorenson got out to a solid lead at the halfway point thanks to her 33.75 backstroke split, the only swimmer in the field to split under 35. But 16-year old Callahan Dunn of the Lyons Swim Club charged to the lead on the breaststroke leg, propelling her to a first place finish in a time of 2:19.80. Elmbrook’s Kaylyn Schoof, another 16-year old, touched second at 2:20.48, followed by 13-year old Hayley Kimmel from Lin Mar, who finished in 2:20.79. Sorenson faded to fourth, touching at 2:21.24. University of Minnesota’s Alexandra Preiss (2:21.83), Green Bay Swim Club’s Emma Lasecki (2:22.98), University of Kentucky’s Morgan Lakes (2:23.45) and Elizabeth Merriman (2:24.25) round off the top eight. Daniel Orcutt completes his sweep of the IM events with his victory in tonights 200 IM. The Kentucky Wildcat took over the lead in the backstroke, and never looked back, finishing the race in 2:03.42. That swim is well under the U.S. Nationals qualifying standard of 2:04.69. Wisconsin’s Chris Willis (2:07.72), University of Kentucky’s Alexander Taylor (2:08.54), Wisconsin’s Stephen Boden (2:08.99), Hickory Willow’s Lucas Smiarowski (2:10.02) and Unattached-Ozark’s Isaak Webb (2:10.74) were also represented in tonight’s A-Final. In spite of the age discrepancy among their competition, the Barrington Swim Club women have been dominant throughout the freestyle events, especially in the distance races. The women’s 1500 was no different. Through the first 500 meters, 14-year old Maggie Graves from Barrington stayed right on 800 free champion Abbey Erwin‘s hip. Inching closer and closer to the Minnesota Gopher, Graves overtook the lead at the 600 mark, which is when she really started to turn it in. Graves won the race in dominant fashion, posting a 16:58.19 ahead of Erwin’s 17:03.32. Barrington put up yet another swimmer in the top three, with 16-year old Jane Smith’s third place winning time of 17:10.61. Also joining these women in the top eight were Lakeside’s Bryn Handley (17:17.85), Saint Charles’s Audrey Guyett (17:20.65), University of Kentucky’s Payton Neff (17:22.50), Iowa Flyer’s Aurora Roghair (17:22.88) and Riptide Swim Team’s Katia Soudakova (17:36.31). The women’s splash and dash was a nail-biter, with the top three separated by merely 0.01 seconds. University of Iowa’s Sarah Schemmel managed to get her hand on the wall first, finishing in 26.20. 15-year old Mckenna Stone from Fox Valley Swim Club, and Malorie Han of Northwestern University Men’s 50 Free tied for the silver medal, with both athletes touching in 26.21. Also competing in tonight’s A-Final was Elmbrook’s Gwen Gustafson (26.53), Northwestern University’s Calypso Sheridan (26.82), Wisconsin’s Abigail Kochevar (26.82), High Tides’s Grace Hanson (26.94) and Unattached-Indiana’s Mary Smith (27.00). Swimming in his home pool, Iowa Hawkeye Joe Myhre won the men’s 50 free in barrier-shattering style, finishing to the wall in 22.83, breaking 23 seconds for the first time. Myhre’s time narrowly missed Derek Toomey’s pool record of 22.76 set back in 2014. The Kentucky wildcats picked up the next two spots on the podium, with teammates Jason Head and John Mitchell posting times of 23.21 and 23.31 respectively. Iowa’s William Scott (23.33), Kentucky’s Peter Wetzlar (23.34), Wisconsin’s Tyler Zelen (23.39) and Kevin Braun (23.58) and Hickory Willow’s Aidan Farley (23.61) also finished in the top eight. Tom Schab, who swims for the University of Iowa but is registered under Unattached-Central California, took the men’s 1500 free in pool record fashion, touching the wall at 15:56.68 to break Marcus Guttman’s pool record of 15:58.04 that was set back in 2012. Unattached-Minnesota’s Michael Messner, who nearly ran down Schab in the last 100, was also under the pool record time with his 15:57.88. Following him was Unattached-Minnesota’s Matthew Hedman who put up a 16:02.95. 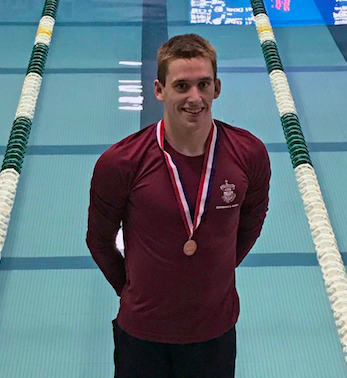 Also comprising tonight’s A-Final was Minnesota’s Nicholas Plachinski (16:04.81), Riptide Swim Team’s Timothy Rizzo (16:20.39), Elmbrook’s Connor Rumpit (16:31.96), Saint Charles’s Ricky Williams (16:43.15) and Barrington’s Daniel Langlois (16:45.85). Elmbrook Swim Club took the top spot on the podium with a total time of 4:19.46. Second place went to Saint Charles Swim Team with their 4:21.39, cementing their first place in the women’s team scores. WEST Swim Club took the bronze, finishing in 4:24.06. Wisconsin Aquatics dominated the men’s 400 medley relay, winning in a time of 3:46.48, a little over a second off the pool record of 3:45.12. Fox Valley Swim Team came in second in 3:51.79, and the University of Wyoming completed the podium with their 3:56.39.